It's important to keep something in mind when it comes to Tomorrowland: this movie was originally created by Disney to shamelessly promote its own theme park, and as such it never really had any business being a good movie. But when Brad Bird signed on, we all (myself included) immediately began setting ourselves up for disappointment. It's almost as if The Lego Movie, the best 90-minute commercial not just for Legos but for anything ever, has prepared us to expect art from this sort corporate pandering. 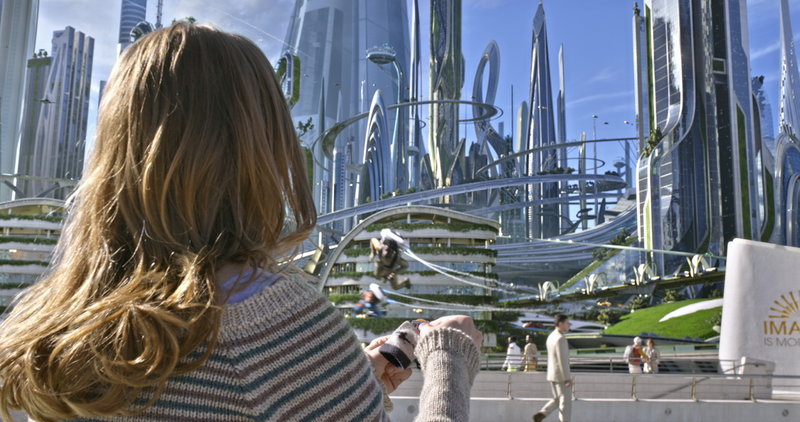 Tomorrowland is not a great movie, but then again we never really should have expected it to be one anyway. A lot of blame for the film's lack of success has also been placed at the feet of Damon Lindelof, and while I don't have as much antipathy for the (in)famous Lost writer as others, it's hard not to see his fingerprints on the cracks in the screenplay. At its core it's a story about a smart, hopelessly optimistic girl who finds a pin that shows her a futuristic alternate dimension that she ends up pursuing at all costs, but the narrative and thematic coherence of Bird's other work is missing here. Instead we get an overabundance of characters self-consciously spouting the message of the film (feed the right wolf!) and tangential subplots without enough setup or payoff (not to mention the unnecessary 130-minute run time). I'm the last person you'll find wasting time picking apart Tomorrowland's plot, but what does get on my nerves is the film's unbridled didacticism. More than being fun or provocative or enlightening, the film seems most concerned with teaching its viewers a lesson, and the resulting attitude comes off as more than a little condescending. Beyond the tone of its message is also the question of its timing: as a movie which bemoans the abundance of dystopian fiction in popular culture, it couldn't have chosen a worse time than after the show-stopping explosion of Mad Max: Fury Road. 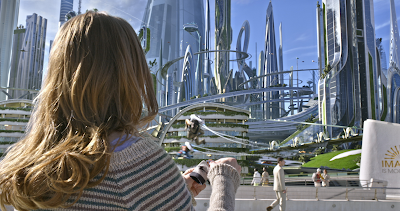 Next to George Miller's powerful creation, Tomorrowland feels like a curmudgeonly conservative looking back to the past rather than forward to the future. Much has been made of this perceived conservatism, and the movie has been unable to avoid comparisons to the objectivist philosophies of Ayn Rand (further reading). While it's undeniable that Brad Bird also celebrates human exceptionalism similarly to the way Rand does, the crucial distinction these comparisons miss is that while Rand's heroes use their extraordinary abilities simply to enrich the self, Bird's heroes always use their powers for the other. Hugh Laurie's Nix is the most Randian character in the film and he's its antagonist, using his power as the leader of Tomorrowland to keep its genius separate from the lowly masses of Earth and refusing to help them in their time of need. Insofar as it engages with Rand's politics, it is an effort to overcome them: Bird wants Tomorrowland open to the world, to share the genius of the few with everyone. Unfortunately this complex thematic kernel is buried in a film that doesn't have much else going for it and leans on this one idea far too heavily. It also never addresses both the way dystopian fiction frequently uses its dark premises in order to move past them (for every movie that revels in its destruction of the Earth, there's one that tries to find a way to fix it) and—much more problematically—the fact that the film itself is hypocritically dystopian. It shows the ultimate perversion of Tomorrowland's creativity into cynicism and threatens the imminent doom of the Earth's inevitable demise. It is itself the thing it seeks to critique, somehow managing to lose sight of the constructive potential of dark science fiction while simultaneously trying to use dark science fiction constructively. But this structural hypocrisy isn't even Tomorrowland's biggest problem. It manages to put together two great stars in the experienced George Clooney and the promising Britt Robertson and then give them almost nothing to do. Clooney is the grumpy old grouch and Robertson is the naive young ingenue (whose father is unfairly sidelined for most of the film), and while the former spends the whole movie grumbling about everything, the latter spends it being amazing and asking how everything works (often as much for herself as for the audience). Somehow the 14-year-old Raffey Cassidy gives (and is given) the most memorable performance as the cheeky troublemaker with a surprising amount of heart. Look at that beautiful green screen! 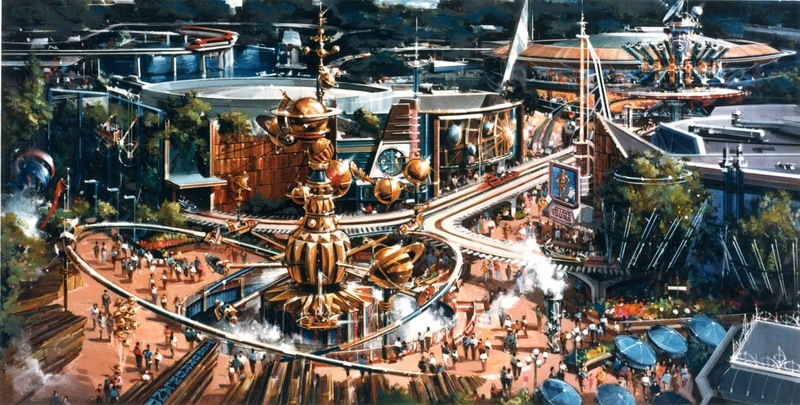 Still, even with all these shortcomings, it's important to remember that Tomorrowland was only ever meant to be a bit of corporate self-promotion, and that it never really had any business being great. Considering that the motivation behind the creation of the film was never more than financial gain, I have to say that Brad Bird succeeded in giving it more heart than it deserved. It's still undeniably hamstrung by its messy characters and storytelling, overly instructive attitude, and potentially contradictory politics, but there's still something here, and maybe that's all we should have expected to begin with. Brad Bird | 2015: New Releases | Metacinema | Spaceship! Is it just me, or is the pin kind of a backwards version of the glasses in They Live? Maybe it’s just because I happened to watch the two films back to back, but here goes: the pin takes us from the real world (the sort of baseline reality) to the fantasy world (something more elevated, painted over by the inhabitants’ futuristic vision); the glasses in They Live take us from the fantasy world (the world painted over by the aliens’ ideological propaganda) to the real world (the baseline reality beneath that ideology). Also, Howard Roark in The Fountainhead is Hugh Laurie’s character (Nix) in Tomorrowland. This is what happens when I watch three movies in the same day.